Order your wreath before Thanksgiving to have it placed on a Veteran’s grave on December 15th – in time for Christmas! 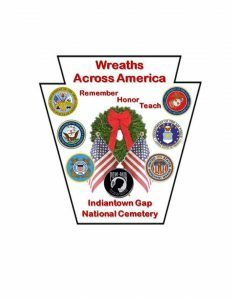 On Saturday, December 15th 2018 at noon, over 8,000 volunteers will place wreaths upon veteran’s graves at Indiantown Gap National Cemetery as part of Wreaths Across America (WAA). This is a national program that started in 1992. The goal of Wreaths Across America is to Remember the fallen, Honor those who serve, and Teach future generations about the cost of freedom. Over 1,500 National Cemeteries around the world will all hold ceremonies simultaneously at noon, followed by wreath placements throughout the cemeteries. Our ceremony will be held at noon on December 15th, in the Pennsylvania Veteran’s Memorial at IGNC, and includes the placement of seven ceremonial wreaths to honor each of the Armed Services, Merchant Marines and POW/MIAs. The Service wreaths will be placed by Gold Star Mothers and Active/Former Service members. Central Pennsylvania youth organizations provide over 2,500 young volunteers to take part annually. They help start the season of giving in a powerful, meaningful way – by honoring those who gave all, or gave a significant part of their lives, to secure the freedoms that we all enjoy today. In 2017, we placed 30,764 wreaths, but that was short of the 38,000 wreaths that are needed to place a wreath on every grave at the cemetery. The goal of 40,000 this year is to adorn each grave site with a wreath at IGNC. Wreaths can be sponsored for $15 by going to www.wreathsacrossamerica.org and clicking “Sponsor Locally” under “Find a Fundraising Group” click on the box that says “Group Name” and type in “PA0006P” (which corresponds to the IGNC Memorial Council) and then click on “search”, then click on “donate” and process an online purchase – this will ensure the wreath is delivered to us at IGNC and your purchase through our fundraising group will help offset some of the costs associated with the ceremony such as buses, rental trucks and patches for youth participants, and any additional proceeds will go to purchasing more wreaths for IGNC. Donations by check should be made out to “Wreaths Across America” and mailed to us at IGNC Memorial Council, Inc., PO Box 58, Annville, PA 17003. Please annotate “IGNC WAA, PA0006P” in the check memo. Check out www.wreathsacrossamerica.org and go to the IGNC page, or you can find us locally on Facebook at www.facebook.com/WAAIGNCPA, and now on Instagram at wreaths_across_america_ignc.